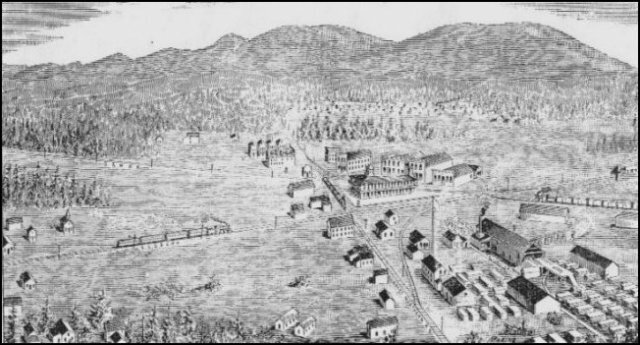 This bird's eye view of Woolley is a drawing from an 1890 issue of Washington magazine. We are looking southeast from P.A. Woolley's sawmill, which was located northeast of present downtown Sedro-Woolley and about where Skagit Steel once stood. That is Clear Lake Hill in the background beyond the Skagit river. This is the town of Woolley in the foreground. You can see the famous 3-train triangle with a row of buildings along Northern avenue at the back end of the triangle, which is almost horizontal. The train on the diagonal from the lower left to upper right is the Seattle Lake Shore & Eastern; the train on the diagonal to the left is the Fairhaven & Southern; and the train on the tracks along Northern avenue is the Seattle & Northern. One look at the newspaper that Clear Lake historian Deanna Ammons showed me this summer told me that she had discovered a completely unknown secret about the very earliest days of Sedro and Woolley. Every book and published pioneer memoir has implied that the merger of the towns in 1898 was the result of efforts by town leaders in 1896. No source has ever mentioned that the merger came very close in November and December of 1891, just months after the towns were born. But there it was, in black and white, in the Dec. 5, 1891, issue of the Skagit County Times. An unknown pioneer named Robert Duff circulated a petition in the town of Woolley on Nov. 16, 1891, requesting an election about the merger — then termed consolidation — on Dec. 19, 1891. In the Dec. 5, 1891, issue, Woolley city attorney A.W. Salisbury rained on Duff's parade by pointing out three problems with the proposal, backing up his opinion with quotations from the statutes of the state of Washington, which had become a state barely two years before. The towns were also brand new. The original two villages named Sedro merged and their residents voted to incorporate as a city of the fourth class on March 4, 1891. Two months later, P.A. Woolley's company town voted to incorporate as a similar city on May 11. Salisbury pointed out that neither town had conducted a municipal election called for in the statute because the elections of officers were just temporary until the election to full terms on December 8. Another problem was the combined acreage of the proposed city. Cities of the fourth class were limited to a square mile in area. This helps explain the mystery of the three towns in the 1900 and 1910 censuses: Sedro-Woolley, Sedro and Woolley. When the towns did eventually merge — coincidentally on Dec. 19, 1898, exactly seven years after the proposed election, the extra two towns retained their incorporation for all the acreage over a square mile. Several old timers told us early on in our research that they had heard that the city fathers wanted to qualify as a fourth-class city because a third-class city was required to have a much costly fire and police department. That is why there were only three structures in town with more than three stories: the Hotel Sedro, the Bingham mansion and the Vanderveer mansion. A fourth-class designation limited the size of the fire department and the equipment needed to fight larger fires in multi-story buildings. Would the new town be Sedro or Denver? 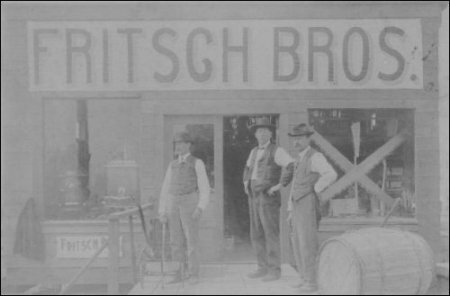 Fritsch Brothers hardware store. We think this is their first store, a woodframe structure in downtown Woolley, circa 1891. The subsequent store was built in 1897 and that one burned in 1911 and they subsequently rebuilt it of stone and brick. It could, however, possibly be the original store on Jameson Street that they bought from Herman Waltz in the late 1880s. Ambrose B. Ernst, the new owner of the Times, hedged his bets, however; he advertised positively about the consolidation within the newspaper and he laid a bombshell that we are still trying to figure out. In a promotional ad, he stated: "Whether to be Denver or Sedro has been settled." Had there been an election by then? Or had there been a straw poll in one or both of the towns? In the 1820s, newspapers began doing straw polls in the streets to see how political winds blew. The expression "straw poll" goes back to rural America where it derived from another old saying, "straws in the wind." A farmer once threw a handful of straws into the air to see which way the wind was blowing. We also remember from the time that the women in the little village by the river rose up against Mortimer Cook and demanded a more respectable name than Bug. The names of Denver and Sedro were contenders back then, too. Who was the settler then who suggested Denver? Was he or she still pushing that name to the forefront? Unfortunately, we may never know the answers to these questions unless we find more pages from this issue or from issues around it. So now we know that there was a serious effort at consolidation in 1891. Our dear readers may ask: was the idea proposed again after the election of December 8? Of course, we do not know for sure. But one thing we do know from various sources was that P.A. Woolley did not like the idea of consolidation and he especially did not want the combined towns to be called Sedro. When the merger finally did gain strength in 1898, he apparently only acquiesced when his name was affixed behind the hyphen. By the way, the Times office was then located somewhere in the town of Woolley. How do you suppose P.A. reacted to Ernst's alternative names for the merged towns? Salisbury was a mystery name in the story until we remembered the feature we wrote three years ago about Harry Lincoln Devin, the pioneer realtor from Sedro. We went back and read that story again and found this tidbit: In a conversation on July 1, 1896, with A.W. Salisbury of Seattle, head of the state weather bureau, Harry learned of the need for a Skagit county official weather reporter. Salisbury's trail grows cold from there. He isn't listed in any of the three volumes of Clarence Bagley's definitive History of King County. If you will pardon the pun, Salisbury may have known back then which way the wind blew for the straw poll. First, whether the number of electors who shall petition can be determined. Second, whether the vote could be legally canvassed and a special election of officers called. Third, whether the consolidated town can comprise more than one square mile in area. The council or other legislative body of either of such corporations shall upon receiving a petition therefor signed by not less than one-fifth of the qualified electors of each of such corporations as shown by the votes cast at the last municipal election held in each of such corporations, submit to the electors of each of such corporations, the question whether such corporations shall become consolidated into one corporation. There has not been any municipal election held in either of these towns. The only election that has been held is that provided for in section 2 of the act relating to the organization and government of cities and towns (Session Laws 1889-90 page 131), which act provides for the election of persons to fill the various offices at the same time the vote is cast as to whether or not the towns shall incorporate. This can in no way be held to be a municipal election as designated in section 10 as before quoted. It was the initiatory meeting specially provided for in section 2 and the persons elected at the meeting became officers only upon the condition that the vote to incorporate prevailed. The petition therefore presented to your honorable body and purported to be signed by "more than one-fifth of all the qualified electors in each of said towns as shown by the vote cast at the last municipal election held in each of said towns," while following the exact language of the statute, is in view of the facts which I have stated insufficient. I do not mean to say that the consolidation of the towns properly made at an election property called by your honorable body under this petition would be necessarily illegal. Such action, however, by your honorable body, in the light of the statutes would be irregular; and in view of the fact that the regular municipal election is to be held in each of said towns within a few weeks; and that a petition properly signed after that date would not be open to this objection, I would advise, were this the only objection raised, that this petition be not granted, but that the petitioners be requested to present a petition properly signed after the municipal election has been held; and upon which your honorable body could proceed in accordance with the direct working of the statute. which legislative body of the two towns should call a special election for the consolidated corporation. It might be possible to obtain the census returns from the territory afterwards incorporated into the respective towns and when so obtained the territory having the greater number might be regarded as the one where the returns should be canvassed and the legislative body of which should issue a call for the special election to be held in the new and consolidated corporation. If this were not possible the towns could agree up and decide at which of the two the returns should be canvassed and which should issue the call; both being done at and by the same town. As it is impossible to cure this objection some such action on the part of the towns would be necessary in order that this question might not be raised after the consolidation of the towns. I now come to the third and last objection and one which I am constrained, after a close examination of the statutes and decisions of the various states, to declare in my opinion to be an insurmountable objection to the granting of the petition. The town of Sedro includes within its corporate limits an area of nearly one square mile. The town of Woolley includes within its corporate limits an area of nearly three-quarters of a square mile. The consolidated town would therefore contain an area of not less than one and one-half square miles. Both of these towns, it is needless to say, are towns of the fourth class and the consolidated town would also, on account of its population, necessarily be a town of the fourth class. Sec. 15 of the act before referred to provides: "That not more than one square mile in area shall be included within the corporate limits of municipal corporations of the fourth class." This is a plain and unrestricted provision of the law and I know of no way in which it can be set aside. That the legislature has itself so regarded it is also plain. Senate Bill No. 54, Session Laws 1891, was passed for the express purpose of legalizing the incorporation of municipal corporations of the fourth class which ha incorporated with an area exceeding one square mile, and the act provided for this purpose required that each corporation wishing to avail itself of the provisions of this act, must first have its territory reduced to an area not exceeding one square mile, and furthermore restricting such corporation to 60 days in which to take the step provided in said act for this purpose. The section relating to the limitation of area must be construed therefore to apply to the consolidated town as well as other towns of the fourth class. Its position in the act, coming as it does after the section relating to the consolidation of towns would be of itself sufficient to sustain this view. In addition to this, however, the act of the legislature of 1891 shows conclusively how important this provision is. The consolidation of the two towns into one corporation is of great moment both now and hereafter; and upon the legality of such consolidation its future will depend. A new corporation is to be organized which is to take the place of the two already existing. In order to exist even, without regard to any further growth or development, it must have the power to legally levy and collect taxes [Emphasis in original]. If it is to grow and develop as we claim and expect, it must have the power, in addition to this to levy and collect street grade assessments, to contract indebtedness or borrow money for municipal purposes on its credit, and to issue negotiable bonds therefor. This can only be done and bonds so issued can only be floated when there is no doubt of the legality of the organization of the municipality. 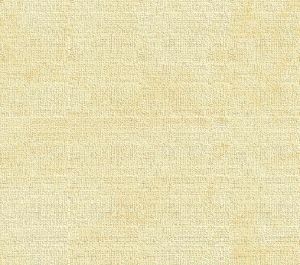 Any doubt as to the legal incorporation of a town invites litigation against the assessments and renders its bonds as worthless as the parchment upon which they are engraved. I therefore advise you that such attempted consolidation will be illegal and useless, and that you should refuse to grant the request of the petition herewith returned; believing that if I am in error in my views of the law, the future consolidated corporation, when organized under a decision of the supreme court of the state to that effect, will grow and develop much more rapidly than it could possibly do if organized without such decision. Dated at Woolley, this third day of December, A.D. 1891. Read local business history at the Check Out Sedro-Woolley First page, where you will also find a complete listing of more than 100 stories about Sedro-Woolley pioneers and events from 1878 to the present, including the history of many old saloons. The Dec. 5, 1891, Skagit County Times. In it you will find details of what P.A. Woolley's company was like in its first year, plus the preparation for the Dec. 8 election where four different parties nominated their slate of candidates for municipal office in Woolley. Please email us if you have copies of any early county paper before 1920, or copies of the early Snohomish Eye, the Northern Star, the Stanwood newspapers, or any from Fairhaven and early Whatcom county. We do not need to see the original copies. Photocopies will be fine or scans if you have them. If you do not want to keep the originals, we can refer you to museums that will preserve them for you.